Located a mere 45 minutes from the spectacular Victoria Falls, Matetsi Private Game Reserve forms part of a huge conservation area that extends throughout northwestern Zimbabwe and into Chobe National Park in neighbouring Botswana, with no fences to restrict the natural movement of species. Matetsi is arguably one of the most interesting of these concessions and a very good addition to a luxury holiday at Victoria Falls. There are two luxury lodges in Matetsi, both providing a relaxing way to experience the wildlife of the area. Matetsi is set on the very banks that Livingstone wrote so extensively about in his journals and it is clear to see why he was so enthralled by the area. During the winter months, elephant can be often seen roaming throughout the park on their way to and from the thirst quenching Zambezi River. Visitors can explore the area on exciting game drives and boat cruises on the river are also available. Renowned for its rich game viewing and particularly high concentration of elephant, this 50 000 hectare (123 600 acre) private game reserve offers a superb variety of wildlife. Massive herds of elephant and buffalo can be encountered along the picturesque banks of the Zambezi River, while rare sable and roan antelope roam the woodlands. The reserve is one of the few in the country to offer night game drives, giving guests an exciting opportunity to view the nocturnal hunting habits of lion, leopard and spotted hyena. Matetsi is also a birdwatcher’s paradise, with more than 366 bird species recorded at the reserve. With 15 km (nine miles) of exclusive Zambezi River frontage, Matetsi offers an unrivalled river experience in addition to spectacular game viewing and birdwatching. Guests delight in afternoon riverboat cruises and guided canoe excursions along the Zambezi River. Matetsi is a privileged game reserve: Zimbabwe businessman John Gardiner secured a long-term lease on the 123,500-acre land and invested millions of dollars in supporting and encouraging wildlife. (Anti-poaching security officers patrols the reserve using a high-tech radio system). His efforts have resulted in a rich game-viewing experience that includes large herds of elephant and buffalo, prides of lion, kudu, sable and roan antelope, hippo, leopard, African wild dog, spotted hyena, and more than 300 bird species. 30 км вверх по течению Замбези от Водопада Виктория. 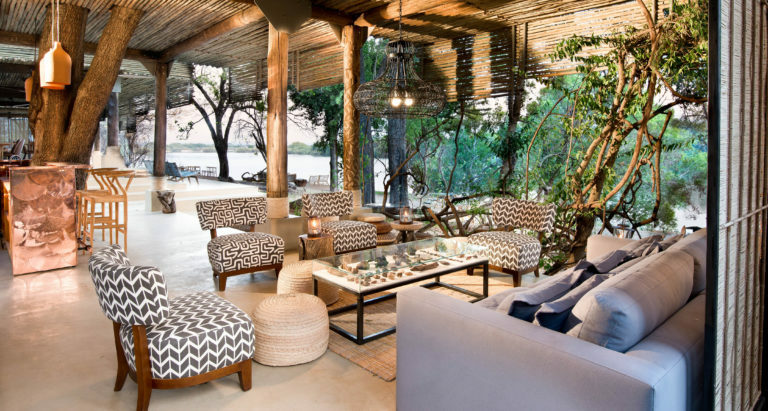 Offering a unique combination of rich wildlife viewing and scenic Victoria Falls experiences, Matetsi River Lodge is set on a massive concession that boasts 15km of private Zambezi River frontage. Matetsi Private Game Reserve offers the most exclusive game viewing experience in Victoria Falls. Here, surrounded by flourishing wilderness, phenomenal highlights include sightings such as massive herds of elephant and buffalo as well as the rare and majestic sable antelope. The reserve is also home to lion, spotted hyena, African wild dog and leopard. Twice-daily game drives in the privacy of the concession are conducted in an open air safari vehicle in the early morning and late afternoon, accompanied by an armed ranger and tracker. An interpretive bush walk, led by a professional ranger, is an absolute must for those looking to get even closer to the incredible wilderness of the reserve. This adventure-filled activity allows guests to learn more about the intricacies of the African bush, with the thrilling opportunity to get up-close-and-personal to its inhabitants, from small to large. A walking safari is truly a feast for the senses! После глобальных изменений, Matetsi River Lodge был заново открыт в августе 2016 года. Стоит на территории Частного заповедника Matetsi Private Game Reserve и занимает территорию 500 км² по течению реки Замбези. Заповедник находится в 45 км от Водопада Виктория, и для постояльцев лоджа ходит ежедневный бесплатный шатл. Комплекс построен в стиле знаменитой древней столицы страны - Великого Зимбабве, с использованием национальных природных элементов и декорирован натуральным деревом и камнем. Гости могут пользоваться 25-метровым бассейном-инфинити. В лодже 18 апартаментов, обращенных к реке, но для сохранения высокого уровня обслуживания они разделены на две части - восток и запад, создавая два лагеря из девяти сьютов. Каждый из них имеет свою собственную основную зону, персонал, управление и работает полностью независимо друг от друга. Рядом находится частный дом, Matetsi River House, который расположен между лагерями и вмещает только одну группу.